Summer reading is in full swing in my house! 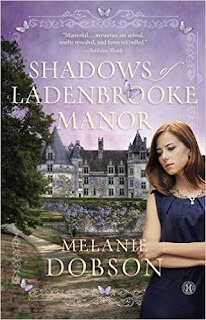 I have a wonderful book Shadows of Ladenbrooke Manor by Melanie Dobson to share with you today! I loved this book so much that I read it in about 2 hours! I couldn't put it down! This was a beautiful story of learning to love regardless of someones personality or past. I love when a story unfolds by sharing a bit of the past while also being in the present. Dobson seamlessly does that when she introduces us to Heather and we discover her parent's past along with her. This book has mystery, mixed with the tiniest bit of romance. Mostly though we learn to love a free-spirited child Libby and see the world from her eyes. Autism is something near to me as I have relatives and friend with children on the spectrum. It was clear from the beginning of the book that Libby was autistic. It was interesting how the author showed the difference in today's way of thinking to years past. In her author's note at the end she confirms this. I have to admit I shed many tears while reading this one. Not sure if I am just overly hormonal with this pregnancy... but I felt for the characters as they struggled to love and live their lives. It was beautifully written and I can't wait to read another of Dobson's books! You can purchase your copy of Shadows at Ladenbrooke Manor at your local book retailer or at online stores like Amazon.